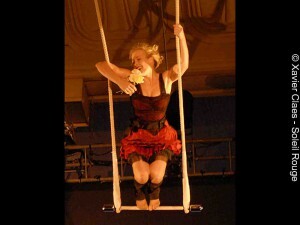 Born on a swinging trapeze on the hillsides of the Diois, Violaine always dreamed of becoming a trapeze artist. Sports is basically not her thing but she definitely had the feeling for the great swing. At ESAC (2005), she became an aerial acrobat. After a tour in Peru (2008) with the company la Tarumba, and several events with Franco Dragone notably, she was one of the six performers in the show “Vole et tais-toi” (Fly and shut up) in 2010.